How is the Testmasters PE Environmental Exam Course Set Up? Review Course: Theoretical concepts are explained to refresh and give students an understanding of important PE Environmental Exam topics. Many example problems are worked out in class to reinforce these concepts. The focus of the Testmasters PE Environmental review course is to review the important concepts needed for the exam and begin the development of the student’s problem solving proficiency. How long are the courses and what are the topics covered? The PE Environmental Exam Test Course is a 30-hour review course and workshops will take selected topics from the PE (Civil) review course and workshops. The following topics are covered: Hydraulics, Water Treatment, Wastewater Treatment, Pumps, Hydrology, Groundwater, and Wells. This will help to prepare, but not provide a complete preparation, for the exam. No Guarantee of Passing applies for this examination. The Testmasters PE Environmental course is a subset of the PE-Civil review course and workshops. You will be attending selective dates from the Testmasters PE Civil course and workshops. However, the exact dates will be finalized once the topic schedule is set. You will then be notified of the days you will need to attend, along with the topics covered on those days. What is the format of the PE Environmental Exam Review? This 30-hour review courses partially prepares students taking the PE (Environmental) exam. Students will take selected topics (Hydraulics, Hydrology/Groundwater/Wells, Pumps, Water and Wastewater Treatment) from the review course and workshops offered for Civil Engineering. This will help to prepare but not provide a complete preparation for the exam. What Testmasters course materials will I receive? 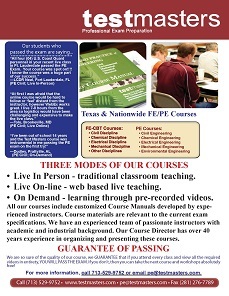 The fees for the Testmasters course include extensive course notes. All teaching is done from these notes.